A 50's rock-n-roll theme using pictures of singers and entertainers from that era. "S"-curved divider walls with restaurant style seating. Wall painting in diamond geometric patterns. The principal's chair in the dining room is a beauty shop chair with bonnet. A real theatre marquee allows the school to advertise the plays that are held in the multi-purpose dining room. A real theatre marquee is used to highlight the plays performed in this multi-purpose room. In every school, we try to create whimsy and make the students smile. 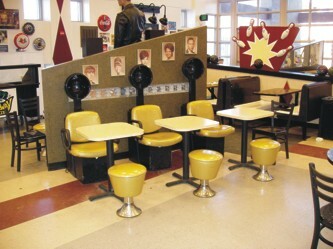 Here, the principal and staff sit in beauty shop chairs when they eat in the cafeteria. Booths with glitter sparkle metalflake finish and car graphic design tabletops. Tables have 45 rpm record graphic tops. 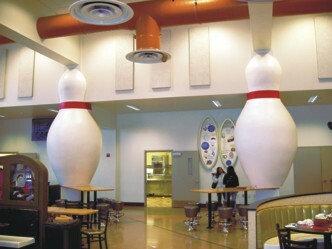 Fourteen foot high bowling pins and tables with soda fountain stools. Way cool! And the students think so too!